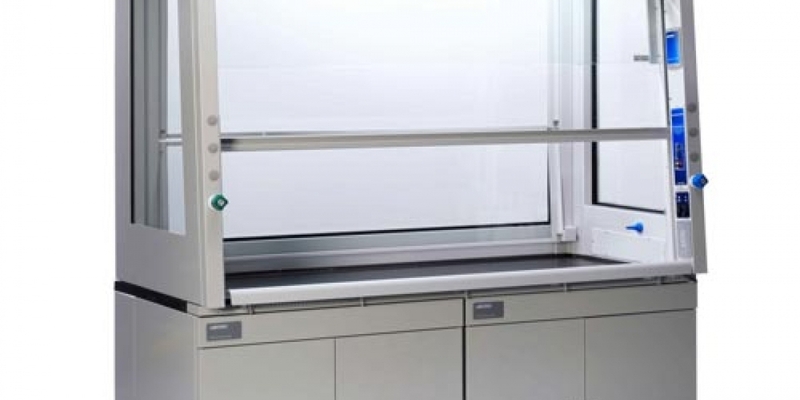 KANSAS CITY, Missouri – Labconco has just released the newly redesigned Protector® ClassMate® chemical fume hood. The new design is the first full view fume hood that meets the SEFA definition of a high performance hood. This means it has been ASHRAE 110 containment tested with the sash fully open (28” above the work surface) at a 60 feet per minute (fpm) face velocity, and there was less than an average of 0.05 ppm of the Sulfur Hexafluoride (SF6) tracer gas detected. In fact, the test reports show the new ClassMate exceeded those requirements, and show an average of 0.00 ppm of detected SF6! The ClassMate’s mostly glass construction allows instructors to keep an eye on their pupils’ safety during class, and the high performance rating gives them extra confidence that the hood will prevent contaminants from entering the breathing zone. The new ClassMate is available with up to eight service fixtures and two electrical duplexes, allowing further customization with easy access to all accessories. Service fixtures can be plumbed from above or below the newly redesigned hood. It can be ordered with either a vertical-rising sash, or a combination sash, and its LED lighting requires only half the wattage of a typical fluorescent light bulb, and provides three times the rated lifetime.